If you’re interested in starting—or improving—a waist training regimen, you know that it’s investment. Not only is in an investment of money, but it’s also an investment of your time and effort, especially if you're using waist training to supplement a dedicated workout routine. 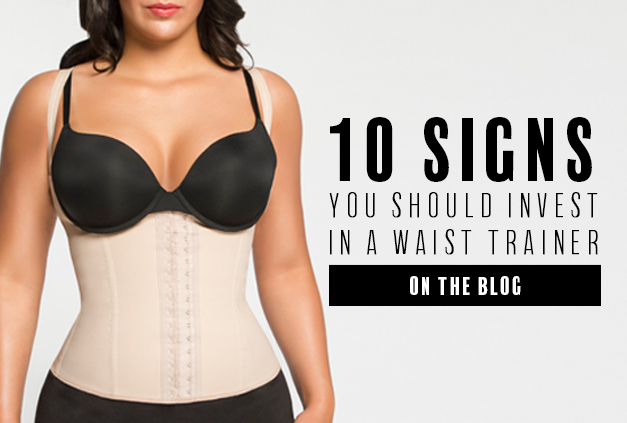 If you’re on the fence about whether to take the plunge into waist training, here are 10 signs it's right for you. While most people are aware that waist training is a great way to slim your waistline and flatten your tummy, you may not be aware of the added perk that it provides for your posture. The firm compression of a waist trainer makes you to pull in your core and straighten your spine while you’re wearing it. This can be a huge benefit for several reasons. First, improving your posture provides the instant benefit of making you appear more confident—which in turn will help you feel more confident. Photographers know this, which is why they tell the subjects to sit or stand with their backs straight for the best results. If you sit at a desk for most of the day, chances are you’re spending a lot of hours in a slouching position. Bad posture can cause shoulder and back pain. Wearing a waist trainer will help you sit straighter and correct your posture. Likewise, if you stand a lot during the day, wearing a waist trainer will help you stand straighter as well. While pretty much every body type benefits from a slimmer waist, that’s not the only effect of wearing a waist trainer. It can also help provide balance to your natural body type. Here’s how it can work with the different types. If you’re a pear shape, a waist trainer will lift your bust and create a fuller bust. If you’re an apple shape, a waist trainer will create a more defined waistline and emphasize your bust. If you’re a rectangle shape, a waist trainer will define your waist and create more curves. If you’re an hourglass shape, a waist trainer will further define and smooth your natural curves. If you’re an inverted triangle shape, a waist trainer will provide more support for your bust and definition for your waist. If you’re ready to increase the intensity of your workouts, a waist trainer may be the way to go! Wearing a workout band during exercise stimulates thermal activity in your core and helps you sweat harder. This in effect helps you to experience a sweatier, more intense workout, which is the kind of workout you need if you want to get results. As we mentioned above, a waist trainer also helps you maintain good posture while you’re wearing it, which can be helpful in a number of workout moves, including cardio and strength training. Most fitness instructors will tell you to keep your back straight and your abs pulled in tight—and your waist trainer will help you do just that. A waist trainer can play a part in your diet and exercise plan. For starters, a waist trainer can be a great motivator. Since you’ll immediately smooth and slim your midsection when you put one on, you may find a boost in confidence in your self-image that will help you stick to your goals. A waist trainer can also help you manage your portions while you’re wearing it, as you’ll feel fuller faster because your stomach can’t expand as much. And as we mentioned above, not only does a waist trainer help you achieve a smaller waist, but it can also help you enhance your curves. During your weight loss journey, a waist trainer will help you maintain the curves you love as you shed off the pounds from your exercise routine. With the right exercises, you can use a waist trainer to supplement workout routines that are designed to build lean muscle and firm abs. Through firm compression, a workout band stimulates heat around your core muscles, helps you sweat and optimizes your workout. For the best results, be sure to do a variety of cardio and strength-training exercises that target all of your muscle groups, as this will help you burn the most fat and show off your muscle tone. Wearing a waist trainer outside of your workouts will also help emphasize all the hard work you’ve done in the gym by pulling in your tummy and keeping it flat. If you’ve already been practicing waist training regularly, you’ll eventually need to order replacements. Taking proper care of a waist trainer will help extend its life, but the latex does eventually wear out and lose its elasticity. You might not notice immediately when your waist trainer needs to be replaced, as the wear will be gradual. One way to tell is to record your results. If you feel like you’ve plateaued after making good progress but haven’t reached your goals, you may want to assess the condition of your old waist trainer. It should feel very tight, warm, and difficult to bend in. If doesn’t seem as tight as it used to be, even on the smallest setting, it might be time to invest again. Sometimes you may be ready to get a new waist trainer even when it hasn’t worn out yet. If you experience such incredible results that your waist trainer is too big, then that’s a time to celebrate and reward yourself with a new one! You’ll be able to tell when it’s time to order a new waist trainer because even when it is pulled to the tightest row of hooks, it will still feel loose. You’ll know because it just won’t feel as effective as it used to, and your results may plateau. If you expect to lose a lot of weight during your waist training, this is one reason why three rows of hooks might be preferable—so you’ll get the most out of your trainer. If you’re pretty close to your slimming goals but mostly want to tighten and tone, two rows may be the better option. Waist trainers get wet—you sweat a lot in them, and occasionally you need to hand-wash them. If you’re wearing a waist trainer as much as we recommend for the best results (8 or more hours a day), then you’re probably going to find that this is difficult due to drying time! That’s why, for dedicated waist training, we recommend rotating at least two waist trainers in your wardrobe. A good rule of thumb is to use one for workouts and one for everyday wear. These two styles are constructed differently and optimized for different activities. You may even want to introduce a third if you have different style preferences. When you first break in a waist trainer, it’s normal for the boning inside the core to warp slightly—it is molding to your figure and will fit like a glove. But over time, whether your waist trainer wears out or your figure changes significantly, if the boning is bending uncomfortably, then you’ll know it’s time to replace the waist trainer. You’ll know because the waist trainer won’t fit as well as it used to and may be uncomfortable to wear. Once you’re waist training regularly, you may find that a different style provides better support and results. Two styles to try if you want maximum compression and support are vest waist trainers and steel-boned corsets. Vest style trainers are like strapless cinchers, only they feature shoulder straps for additional back coverage and breast support. They are an open bust design so you can wear them with the bra of your choice. So, are you ready to invest? Be sure to check out our specially curated selection of the best waist trainers and expert advice—only at Hourglass Angel.